Available as a solo act, duo, trio or a full rock and dance band. Long time Tofino-Ucluelet resident Geoff Johnson has been playing guitar for decades. Over the years Geoff has shared stages with April Wine and John Mayall's Band as well as other rock legends. He's recorded albums, contributed to film scores, and played 100s (maybe 1000s) of gigs. Geoff's wife Tara is a diverse vocalist comfortable singing anything from classic show tunes and jazz standards to grunge rock. The rest of the team is comprised of the very best of the talented and committed pool of musicians who call the west coast home. 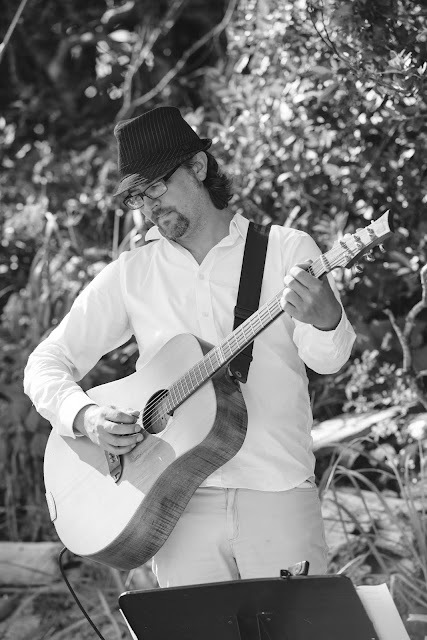 Providing music for outdoor wedding ceremonies, especially on beaches, presents special challenges. Speakers and other gear can be difficult due to the location and lack of electricity so acoustic guitar is an elegant solution. With the help of a small battery-powered amplifier an acoustic guitar player can be heard over the breeze and the lapping tide, providing additional ambiance for your ceremony while entertaining your guests as they gather before the ceremony starts. In most cases Geoff performs for roughly 15 minutes before and after the ceremony while guests gather and mingle. The couple also requests specific songs, (usually 3) for the processional, signing and recessional. Our standard package includes studio quality demos of your requests to hear before the wedding, if you like. A live musician has many advantages over recorded music; Live people are easier to cue than an iPod as they can easily adjust what they are playing in real time. They can start playing a song at a point other than the beginning, replay passages to extend songs when a portion of the ceremony takes longer than expected, adjust their tempo to the bride's pace and other intuitive responses such as resolving a song appropriately when the ceremony calls for it. Most wedding ceremonies are performed instrumentally as vocals tend to draw attention away from the couple. If you really want vocals, no problem. We also offer handheld wireless microphones and speakers for the ceremony at an additional fee. Great before or during dinner at weddings and other get-togethers. Musicians perform a broad mix of familiar music with an emphasis on ambiance as opposed to a full-on concert. Options include; Geoff performing solo with guitar and vocals, as a duo with the addition of Tara's amazing voice and some percussion or a trio with the additional charm of upright bass. This arrangement can be totally unplugged for smaller gatherings or amplified for larger rooms and groups. A female fronted four piece rock band playing classics the 60s through to modern dance hits. We've played all-ages BBQ's, sold out New Years Eve parties at the region's luxury resorts, bar shows and 70th birthday parties all with great success. Unlike our other offerings this is a full-on electric dance-rock band so we need space for drums and a few plugs for our amps. You'll also want to make sure there's room for a dance floor! Booking the band includes sound equipment appropriate to the venue. Every situation is unique; sometimes a specific venue, date, time or other request may require a lot of behind the scenes setup, special equipment or personnel so it's always best to contact us and let us know what you have in mind so we can work out a fair rate and check our availability. Because we don't require compensation for travel and accommodations for events in the Tofino/Ucluelet region, we are generally much more affordable than other options around the island. We've also worked with all the venues and event planners in the region so we know what tends to work best for the various locations and event types. Discounts are calculated for multiple bookings (ie wedding ceremony and cocktail receptions). 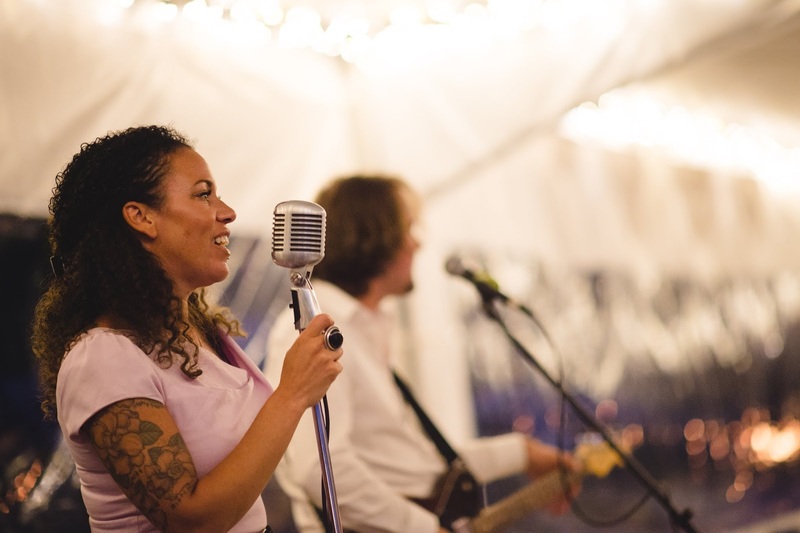 "We couldn't have picked a better band to come and play for our wedding at Blackrock! We had a mix of friends in their 30's and parents in their 60's. They were able to keep the dance floor packed all night by being able to play such a wide variety of songs. We had listened to some of their stuff online but the audio on the recordings doesn't come close to the really thing. They sounded way better in person and one of the things they did that we really liked was occasionally asking the crowd if they would like to hear one song or another. Whatever song got the loudest cheer was played next and kept the party bumpin'. We had multiple comments the next day about it being the best wedding they ever attended and that was mainly due to the band. 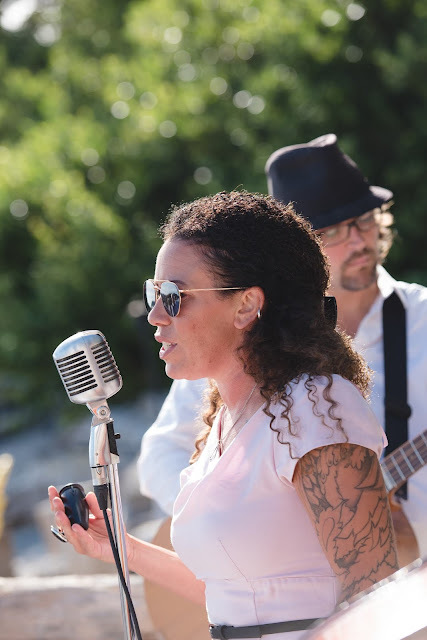 The Tofino Wedding Band Rocks!!" "You guys completely rocked it and capped the beach event last June … people still talk about what a great night that was. I have no hesitation recommending you and am happy to endorse you, you have been great to work with over the past couple of years." "We are thrilled to have worked with you as much as we did! It started feeling odd when you weren't playing at a wedding! So look forward to many more weddings on the beach with you!